So, I'm sure this isn't a new idea but I've made a few of these over the past few months and found them to be really cute and functional with my 2 year old little boy. My mom has a bib like this made out of a bandana cut in half on the diagonal and I thought they would be fun made out of some quilting cottons (and a good way to use up some fabric in my stash). I made some more bibs last week and took a few pictures along the way. They are super easy and really quick to make! I didn't get too fancy with making them... they're only going to get stained and washed a million times. Mine have held up really well through many washings. This type of bib is great because my 2 year old can't get it off during a meal time... all the other ones he can pull off or unsnap. 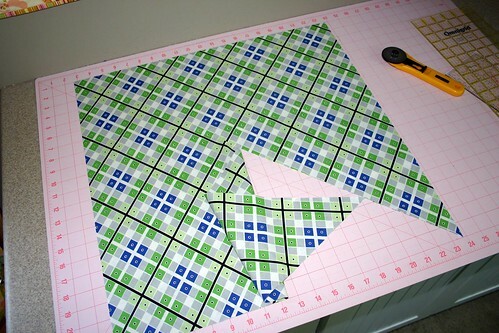 This tutorial will make 4 bibs at one time... you might as well make a few at a time! 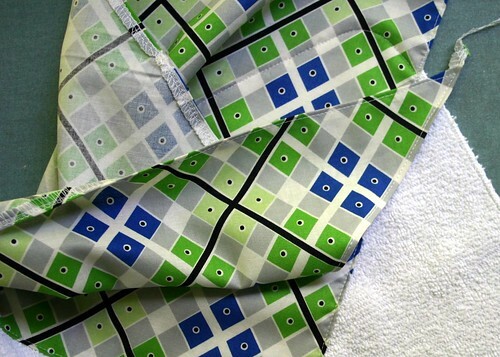 Leave your fabric folded in half and cut it into a 21" square. Now, cut it in half on the diagonal. These are the 4 triangles you will use as the bandana. Serge or zigzag all the raw edges. Press the serged or zigzagged edges to the wrong side. 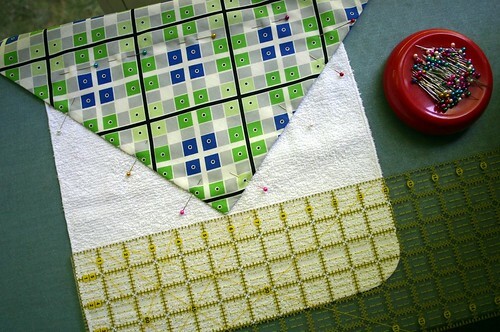 Start stitching the triangle to the washcloth as shown, going across the top of the washcloth. 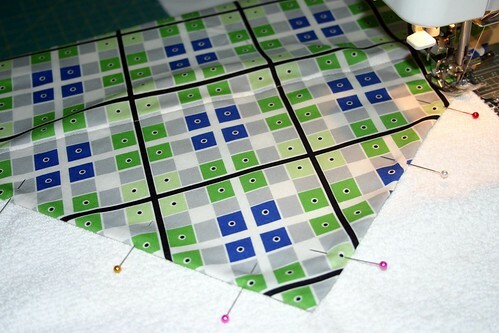 Continue stitching all around the perimeter of the triangle. Here you can see how I've top stitched the bib and I have these ends left on the triangle (the ties). 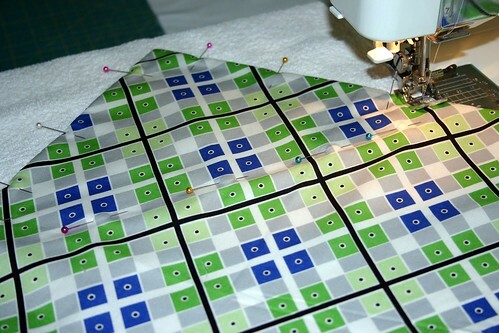 Just snip off the extra thread and fabric. And you're done! It really only takes a few minutes to make one and I'm sure you could have all 4 of them done in a half hour. 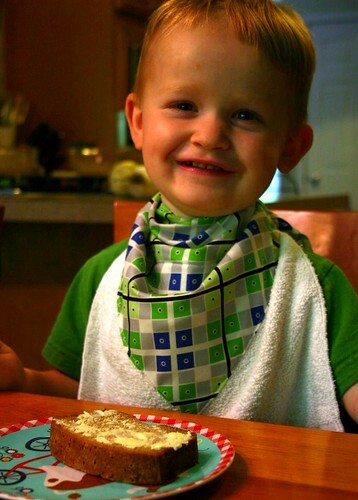 Tie one on your little one and they're ready for a meal! Please let me know if you have any questions. I'll try to answer them in the comments. That is SO cute!! What a fun idea!! aw, those are cute! and D is getting sooo big. That is so cool. Love it! Adorable! I'm done having babies, but there are always baby showers to make people ooo and ahh over these! this is such a great idea! and your model is simply adorable! The last two pictures are just of the points of the ties (the part that you use to tie a knot in the back). There is a little bit of extra fabric at the point that you can cut off (it's left over from when you fold the serged or zig zagged edge to the back). 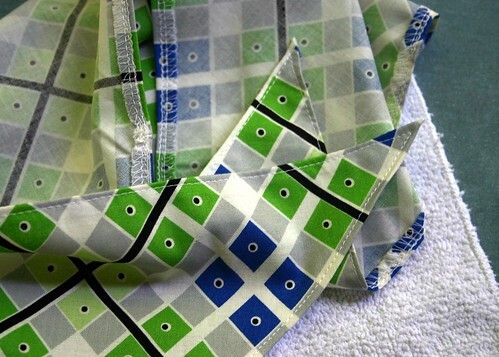 When you're in the process of making one, you'll see the little bit of fabric hanging off... like in the pictures. I hope that description helps more and that you have fun making the bibs! Let us look into the different types of baby bibs which are always in demand nowadays. 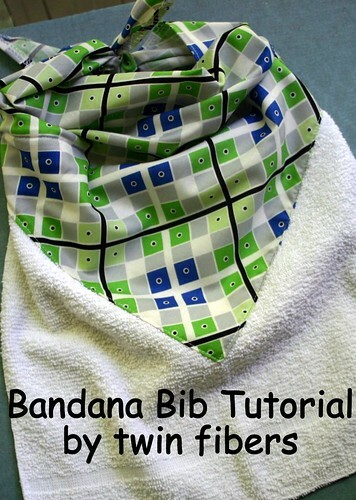 Here is the awesome information for the bandana baby tutorials and thanks for sharing. Love this design! Can you tell me what size the triangle is once it's cut out? As with all infant clothing, wear the bandana bibs with care—use only on a child under direct supervision, and never leave one on a sleeping baby.